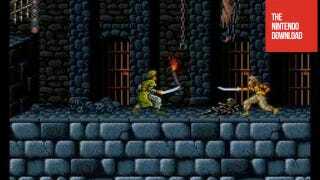 This Week’s Nintendo Download Travels Back in Time For A Classic Version of Prince of Persia. Also: Goat-Stacking. Listen, I love Prince of Persia. With all that lovely animation and derring-do, Jordan Mechner's adventure games are well-loved for good reason. For those wanting to re-visit PoP's charms, the Wii Virtual Console get the 1992 SNES version. But, guys: this Crazy Hunter game that appears in this week's Nintendo Download looks absolutely bizarre. Apparently you need to knock down tower-dwelling goats into a river, fish them out and stack them to the sky to grab hens that lay golden eggs. This doesn't seem like anything I ever saw on Mutual of Omaha's Wild Kingdom when I was growing up. Did Marlin Perkins lie to me all those years ago? Balloon Pop Remix takes the classic Balloon Pop formula and turns it on its head. Use the stylus to draw lines on the puzzle board and all the balloons in the line's path will pop, leading to mesmerizing chain reactions. Survive perilous levels, rescue the princess from the evil Jaffar and claim the royal residence before the hourglass is empty. Beware of obstacles such as unpredictable floors and ceilings, hidden spikes and walls of flames. With the Nikoli puzzle series, you can enjoy high-quality "sudoku" puzzles, created by Nikoli, who gave the world-famous puzzle its name. The Nintendo 3DS allows for the realization of simple and easy to play operability. "Heyawake by Nikoli" contains 50 Heyawake puzzles. "Heyawake" is a puzzle in which you fill in the spaces according to the rules. It's called "heyawake" ("split rooms") because the face of the board is divided into rooms. This puzzle first appeared in 1992, but a plethora of solutions have been developed, allowing for a very progressive puzzle. Each time you discover a new strategic move, your skills of solution will improve. To ensure your long-term enjoyment, we're prepared both a "Stage Clear" mode and a "Random" mode. In "Stage Clear" mode, you progress by clearing puzzles one by one, and in "Random" mode puzzles are generated at random. Please enjoy this high-quality "Heyawake" game. Mad about the ...Hens that lay the golden eggs. Now this is true madness!!! Capture the hens that lay the golden eggs that are scattered around the world. By creating a giant tower tall enough to reach the clouds where the hens are. How to build the tower? Firstly: you must knock over some goats that rest on candy-made platforms scattered along the river. Secondly: fish out the goats you have knocked into the water. Finally, and this isn't easy, stack the captured goats one on top of the other until you make the tower and can reach the hens that lay the golden eggs. With a super high-powered speed boat, and a crane with a hook attached for fishing and building the tower. If you enjoy madcap adventures, do not hesitate to take the controls of our character Dundee the Mad Crocodile. The Black Keys "Little Black Submarines"
This week Nintendo Video™ premieres The Black Keys' 3D video for their hit song "Little Black Submarines". Filmed during a secret show in Nashville, the video intimately captures the raw energy this band generates on stage.